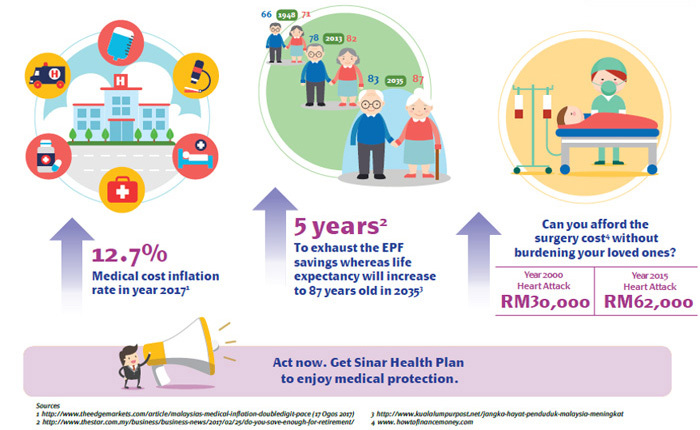 Sinar Health Plan is a Surplus Sharing Group Medical and Health Takaful Plan which provides fixed benefit for hospitalization, surgery and covered critical illness up to RM 1 million overall lifetime limit* There are 3 different plans to choose that suit your budget and lifestyle. HOW SINAR HEALTH PLAN BENEFITS YOU? Fixed benefits up to RM1 million (overall lifetime limit*) payable in addition to any medical and health plan you already have. Fixed benefits for further treatment at private clinics/hospitals. No medical check-ups required until 74 years old for renewals coverage. WHY YOU NEED SINAR HEALTH PLAN?